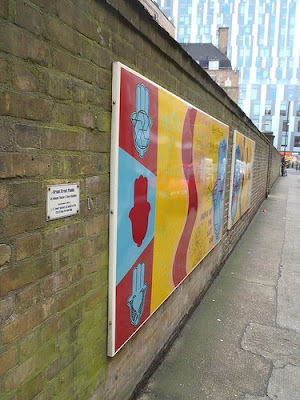 Funded by the City Fringe Partnership and designed by artists Meena Thakor and Kinsi Abdulleh, the Brune Street Panels were added to the walls in Brune Street opposite the Soup Kitchen for the Jewish Poor in 1998. The panels reflect the vibrant history of the local area, with a particular focus on the Jewish cultural influences in the street and surrounding neighbourhood. The former soup kitchen opposite was established to feed the Jewish poor in nearby Leman Street in 1854, and and relocated to the street, Butler Street in 1902. We are told that even in the 1950s it was still regularly feeding 1500 clients, and continued until 1992, when it merged with Jewish Care in Beaumont Grove. Today it is, as readers might expect, a block of flats.